For many years I’ve enjoyed hiking. I explored the popular Adirondack Mountains, the well-publicized trails of our state and local parks, even the trails through private lands being built and maintained by groups of volunteers. But it wasn’t until ten years ago when I began writing trail guidebooks and scouting deeper into available trails that I discovered a hidden treasure. Scattered throughout central and western New York State is an array of public lands that are managed for plant and wildlife conservation, timber harvest, and recreation by the DEC (Department of Environmental Conservation). Trails wind through these diverse properties – trails that are as varied as the lands they traverse. Walking these trails provides an escape from the crowds and fast-paced bustle of everyday life. Your hiking partners are likely to be covered with fur or feathers, not T-shirts and sneakers. Along these trails you’ll find unique treasures, preserved for posterity. One of the treasures is in Honeyoye Falls at Quinn Oak Openings. Approximately 4,000 years ago a major drought caused the demise of many native species of trees and allowed midwestern prairie plants to move east. It created fields of tall grass prairies surrounded by oak forests – oak openings. The Indians noticed these grass openings were havens from bugs and allowed them to get a broader view of approaching enemies so they kept the grasslands open with fire. The absence of trees in the oak openings made them easy targets for farmers. As white settlers moved in, many of the oak openings were put to use to raise crops. Quinn Oak Openings is one of fewer than 20 oak openings remaining in the world. It was spared because it was hard to plow and virtually impossible to sink fence posts into the limestone which lies only a few inches below the surface. This land was privately owned and was used to graze cows. The farmers continued periodic burnings to encourage grass growth. Today, DEC continues this practice to save this unique resource. Within the old forest are several very large sugar maples, New York State’s official tree. American beech can be found with diameters at breast height exceeding 36 inches. Estimated age of eleven of the dominant trees in the forest is between 120 and 200 years, with one 42-inch sugar maple tree approaching 300 years of age. 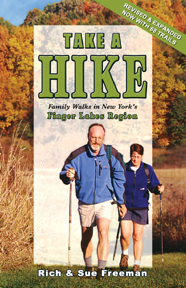 With the book “Take A Hike – Family Walks in New York’s Finger Lakes Region” in hand, watch carefully for two-inch round, blue tags affixed to trees within the old forest, to learn what a DEC forester sees as he walks through a nearly old growth forest. Maybe you prefer to walk in the footsteps of history and enjoy scenic views. If so, try Bare Hill Unique Area which provides awe-inspiring views of Canandaigua Lake and valley. Walk land where the Genundowa Festival of Lights originated. Genundowa was the name of a Seneca village near Bare Hill. Each year in early September, the Seneca Elders and the tribes Keepers would light a large fire on top of Bare Hill as part of the Seneca Autumn Ceremony of Thanksgiving for a successful harvest. This fire was followed by smaller fires along the lake, resulting in a ring of light as a gesture of Indian unity. Seneca history is hidden in legend. One legend says that the first Seneca settlement occurred in Naples Valley around 1400. Other legends assert that they came from the Adirondack area or from Montreal, either following game or to escape warring tribes. In either case, by the 1600s the Seneca Nation numbered over 10,000. Around 1570, five Seneca tribes united into the League of Five Nations, later called the Iroquois Confederacy. Historians call this early government the “greatest achievement of Stone Age man” because of its extensive code of laws. Council Rock at the summit of Bare Hill was the traditional site of the Seneca Indian council fires. The Twin Cedars Environmental Area at DEC Region 8 headquarters in East Avon has a trail that follows the top of a drumlin and runs around man-made ponds. Numbered signs along the route help hikers understand how DEC manages this property for a variety of wildlife habitats. There’s also an A-frame interpretive center packed with exhibits and displays designed to test a visitor’s environmental knowledge and stimulate their curiosity. In the book “Take A Hike! Family Walks in New York’s Finger Lakes Region” there are 18 trails that traverse DEC lands in central and western New York State, each with it’s own unique treasure. Hit the trail and discover the hidden gems on your own. Cemeteries, as a rule, aren’t the first place hikers and bikers think of as destination for outdoors fun. But, Mount Hope Cemetery in Rochester, NY should be an exception. The topography was sculpted by glaciers long ago, leaving kettle holes and eskers. It’s the rolling topography that drew urban planners to the site back in 1838 when a cholera epidemic hit Rochester. At the time, this site was a mile and a half from Rochester. Today it’s squarely inside the city and is home to many famous and infamous past citizens, and a forest of large, old trees. The cemetery is criss-crossed with narrow, winding paved roads that see little car traffic, but make great biking or skiing trails. Walkers and snowshoers can wander the grounds at will, exploring the glacial landscape to hunt for special grave markers. Two guidebooks will help. 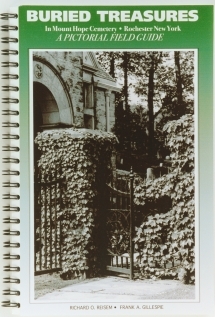 One is “Buried Treasures in Mount Hope Cemetery” which resurrects the stories of some 500 individuals buried here. The other is “Take Your Bike – Family Rides in the Rochester Area” which shows how to find the cemetery, where to park, and provides a map of the narrow roads. This cemetery is fun to explore any season of the year. The Open Space Institute (OSI) announced the donation of 18 acres of forestland brimming with old growth hemlock trees to Black Rock Forest Consortium. OSI is making the donation of 14-plus acres on Sackett Ridge and a 3.6-acre conservation easement on the grounds of Storm King School to honor the 20th anniversary of Black Rock Forest Consortium. The Black Rock Forest Consortium is an alliance of schools and universities, and scientific and cultural institutions that manage the nearly 4,000-acre Black Rock Forest, located in Cornwall, NY, only 50 miles north of New York City. Open to the public, the Forest is home to an extraordinary variety of wildlife and unspoiled habitat, and the Consortium provides scientific and educational programs dedicated to enhancing and protecting the expansive natural backdrop. Today’s donation marks another step in OSI’s ongoing efforts to preserve the special open spaces of the Hudson Highlands and Hudson River Valley, where it has protected more than 100,000 acres over 34 years. Across New York State, OSI has created and expanded parks and publicly accessible recreation areas, protected farm and forestland, and preserved historic treasures. The Sackett Ridge parcel had been a private inholding that was not acquired when Ernest Stillman founded the Forest in 1928. OSI acquired the property—which was a high priority for conservation due to its location high on a sensitive ridgeline, surrounded by the Forest’s Canterbury Brook Ecological Reserve—in 2004, and the Black Rock Forest Consortium agreed to manage it as part of the Forest. OSI acquired the easement on the nearby Storm King School property in 2005, ensuring that the land, located at the entrance to the Forest, would never be developed. The parcel adjoins Storm King State Park on two sides, standing between natural lands and residential development. “This is a wonderful donation, of strategically situated property, both for the ecological health of the Black Rock Forest and, in turn, the surrounding region,” said William Schuster, the executive director of the Consortium. “The preservation of these properties prevents forest fragmentation and ensures habitat connectivity to sustain populations of native species now threatened across our region, and it will also help protect local stream water quality. About 25,000 hikers, students and researchers visit Black Rock Forest each year.